As promised, here is a post from my friend L, who blogs over at Life In Pint-Sized Form, explaining why she chooses to wear a Remembrance poppy. Thank you, L, for taking the time to put together such a wonderful, informative and heartfelt post. Remembrance Day is upon us – the day the Armistice was put into place that ended the First World War, and the day that Canadians take a moment at the stroke of 11 AM to remember our veterans, our dead, and the victims and senselessness of war. Well, that’s what we’re supposed to be remembering. Instead, we have a lot of hypocrisy – people who support wars, who even glorify them, wearing poppies. Notably, our Prime Minister, Stephen Harper, wears a blood-red poppy on his suit lapel while he bids goodbye to the Canadian soldiers going to their fate in Afghanistan. Makes it kind of hard to remember that the poppy is supposed to represent “never another war”. Yesterday Annabelle from The Belle Jar wrote about why she chooses not to wear a Remembrance poppy. She states that it’s because she doesn’t agree with the reasons for wearing it. She doesn’t forget, because we as Canadians don’t forget war. It’s on the History Channel. It’s in movies, it’s in popular culture. There’s a show on TV right now called Bomb Girls, about women who helped the war effort in ammunition factories. We don’t forget the wars. We don’t forget the senseless fighting, the history that came out of it and the way we are because of it. I respect Annabelle’s choice to wear the white poppy, or not to wear a poppy at all. However, I do choose to wear the red poppy of Remembrance Day, and this is why. An 18-year-old boy left his home on the Melbourne Chippewa reserve to join the Navy. He became an officer on a ship headed for the South Pacific, where he fought against the Japanese in the Second World War. He fought despite the fact that his family lost their culture due to the actions of the Canadian government, that he lost his language, his cultural arts, and his identity as a Native man. That man is my grandfather. While we remember the many veterans who fought in the many wars Canada has been involved in, the iconic images of these veterans are whitewashed. We don’t see the people of colour who, despite the treatment they received from our country, fought wholeheartedly for Canada. Stood beside their white military fellows, held the same guns. Manned the same cannons and threw the same grenades. Died in the trenches and on the seas . . . their faces never to be seen again under miles of thick, bloody mud. Why don’t we see those faces when we remember? I choose to remember the sacrifices that our citizens of colour made during the wars. I choose to remember that they didn’t give up their lives, they gave up their culture, their language, their right to freedom, and still fought. I choose to honour those veterans, those Native, African-Canadian, Asian-Canadian soldiers. Those ones we never see. And I wear the poppy not just as a way to remember, but as a statement: freedom doesn’t just belong to white folks. The sacrifices weren’t just made by your English grandfather who manned a gun in World War II. They were made by people who clawed their way back to the surface after our country did its best to bury them through colonization. Who have seen more loss than all of us combined. 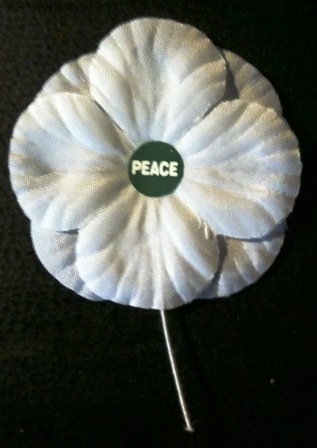 I proudly wear my poppy for peace. For sacrifice. For the victims we lost, and for my grandfather and his Native peers. It’s early November, which means that our dark, sober winter coats, fresh out of their summer storage, suddenly have bright felt flowers blooming on their lapels. Veterans, dressed in their neatly-pressed Legion uniforms, begin popping up in shopping malls and subway stations, asking for donations. The words Lest We Forget seem to be on everyone’s lips, and my Facebook feed is full of sepia-toned images of baby-faced soldiers and battlegrounds in France. Poppy season is here, y’all. 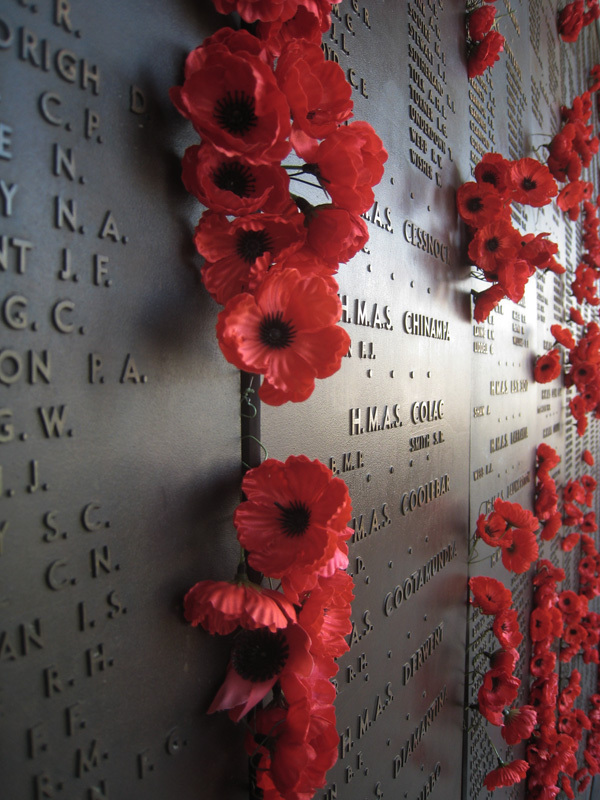 For most of my life, I didn’t really give Remembrance Day a whole lot of thought. I mean, it was just something you did, you know? I liked the grown-up feeling of having someone pin a poppy on my coat (although I lived in terror of being stuck by the open pin), and enjoyed the solemnity of the minute of silence. Remembrance Day as a kid often meant assemblies and pageants at school, or else special projects and discussions. Remembrance Day as an adult living in Halifax meant a day off work and school, because it’s a statutory holiday in Nova Scotia, which, hey, why would I complain about that? On top of everything, I’m a sucker for anything historical, so I always enjoyed reading soldier’s accounts of the war, although I have to admit that I preferred learning about the rations they ate and the clothing they wore to hearing about actual, you know, bloodshed. Still, I felt mainly positive about Remembrance Day in general. Now, though, I feel more ambivalent about it. What, exactly, are we honouring? And, more importantly, why? First of all, let me just be up front about something: Poppa, my maternal grandfather, is a Second World War veteran. He was in the Royal Canadian Air Force, although he never saw active duty, and he remained a fiercely proud pro-military Royal Canadian Legion member until the day he died. I’ve heard friends and family members say that he was the only man brave enough to walk down a post-Bill-22 Quebec street during the local Remembrance Day parade carrying the Union Jack. This holiday is something he believed in, because it honoured the deeply-held convictions about rights and freedoms that his military had fought for. Honestly, I kind of wonder if he’s rolling in his grave right now over what I’m writing here. See, the thing is, I’m pretty sure that I don’t want to wear the Remembrance poppy anymore. First of all, let’s look at the history of the Remembrance poppy. In 1920, it began to be used as a way of commemorating soldiers who had died on the battlefields of World War I; it was chosen to symbolize those soldiers in part because of the poem In Flanders Fields by Canadian poet John McCrae, which describes poppies growing amid soldiers’ graves, and the unrest of the fallen as they wait for their comrades in arms to end the war and bring about peace. The idea for wearing the Remembrance poppy was popularized by American professor and humanitarian Moina Michael, who, in 1918, wrote a poem called We Shall Keep The Faith in which she swore to wear a red poppy in honour of those who had lost their lives in the war. In Canada, we use the poppy as a way of honouring all the servicemen and women who have been killed since 1914. The Royal Canadian Legion is pretty serious about the Remembrance poppy – they don’t approve of any changes being made to the poppy (i.e. using a Canadian flag pin instead of the usual straight pin), and they have, in fact, trademarked the image. Canadian Remembrance poppies used to be made by disabled veterans, but since 1996 they have been manufactured by a private contractor. Although wearing a poppy for the first two weeks of November is not mandatory, public figures who don’t wear one are often frowned upon and disparaged for not honouring their veterans. I’ve been wondering, though, why we need to wear a poppy at all. The line that I most often hear from friends and family is Lest We Forget, but honestly, who’s in danger of forgetting? In the wake of the First World War, which was supposed to be “The War To End All Wars”, it made sense to have a symbol to remember the bloodshed and violence. I mean, sure, if you’re not going to have wars anymore, then you definitely need something to remind of how awful and destructive they are; you need a shorthand to explain to yourself why you don’t ever want to go to war again, right? Sadly, though, that dream never came true – there has been war after war over the last century. A rebellion here, a police action there, peacekeeping here, fighting terror there – and, of course, let’s not forget the bigger conflicts like World War II, the Vietnam War and both wars in Iraq. Why do we need something to remind us of how terrible war is when we’re constantly surrounded by it? On top of that, we live in a culture that constantly revisits, discusses and celebrates war, especially the Second World War. I mean, come on, have you ever turned on the history channel? Every other show is about fighter pilots or Hitler or something else to do with our glorious military past. And let’s not forget Hollywood – how many movies are there about hunky American soldiers going off to fight hunky World War II? Who knew that so many hot dudes were in the war? Not me, that’s for sure! I mean, first of all, you should avoid putting up Christmas decorations in early November because it’s tacky, not because it dishonours veterans. Secondly, I don’t like the idea that the Royal Canadian Legion (this particular image was posted by Royal Canadian Legion Branch 119), is trying to shame and manipulate people about what they put up in their own private residences. Third of all, I don’t think that Christmas and Remembrance Day have anything to do with each other. I have to say, though, that I really enjoy some of the comments left on the post. I especially love this one from Allyson Landry: “The only reason you have the freedom to have Christmas is thanks to veterans”. Er, what? I think that it’s fair to say that if Canada had somehow fallen to the Nazis during the Second World War, we would have nothing but Christmas – it would be the other religious observances, like Chanukah, for example, or Ramadan, that would be missing. My main reason for abstaining from wearing a Remembrance poppy, though, is that I’m starting to feel like it represents a support for all of my country’s military action, not just the sacrifices made by soldiers in past wars. It’s as if by wearing it I’m giving my tacit agreement to Canada’s activities in Afghanistan, or the ways that women are mistreated in the Canadian Forces. The truth is, though, that I don’t want our military engaged in any kind of action; I don’t want to feel like I have the blood of civilians (or, well, anybody) on my hands. I also feel deeply uncomfortable about a number of things that happen within military culture; in fact, if I’m being totally honest, I don’t like the idea of the military at all – guns scare the crap out of me, and don’t even get me started on bombs or drones or any of that stuff. Of course I think that we should honour the men and women who died fighting in our country’s military – especially those who were drafted, and didn’t choose to join the war; but I also think that we should be working to end war, instead of perpetuating it. That’s why this year, instead of wearing a Remembrance poppy, I’m going to try to find a white poppy, which, while still honouring the casualties of all wars, further symbolizes the desire for peace. I’ll still make a donation to the Royal Canadian Legion; I’m just choosing not to wear their icon anymore. The thing is, I guess that’s what it really boils down to for me: choice. Around Remembrance Day, there’s a lot of talk about soldiers dying for our freedoms; I know that freedom, both personal and political, is one of the reasons my grandfather joined the armed forces. I think that he would be happy, then, that, here in Canada, I have the freedom to be a critical thinker. I think he would be happy that I live in a country where I can choose to remember our military veterans however I want, or even not at all. He would be happy that I am free.